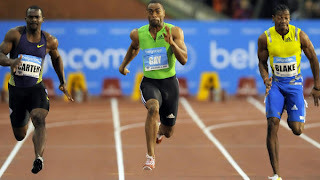 Tyson Gay defies the cold condition and a false start drama to win the men’s 100m at IAAF Samsung Diamond League Memorial van Damme meeting at Brussell, Belgium (August 27, 2010). In front of a sell-out 47,000 seats at King Baudouin stadium, Gay had a slow start but surged at the halfway to win the 100m title in 9.79, defeating Jamaica’s Nesta Carter who improved one hundredth of a second of his record to 9.85. Third place went to Carter’s countryman Yohan Black in 9.91. His time was 0.01 short of his world-leading time set at the IAAF London Diamond League two weeks ago and still 0.21 off Bolt's world record. He earned USD 40,000 and a Diamond Trophy for winning the season-long competition. Gay who ashamed the world record holder Usain Bolt at Stockholm, also beats Asafa Powell however was disappointed for being denied the chance of going head-to-head with Usain Bolt and Asafa Powell. The two monsters were pulled out due to back injuries. Meanwhile Allyson Felix added a Diamond League Trophy from the women’s 200m, thus becoming the only athlete at the inaugural Diamond League meeting to win double trophy. Allyson won her first Diamond Trophy last week in 400m at Weltklasse Zurich. Affected by the chill and wet track, Felix won the event in 22.62, beating fellow Americans Shalonda Solomon (22.70) and Bianca Knight (23.01).